Geneva – IOM, the UN Migration Agency, reports that 154,609 migrants and refugees entered Europe by sea in 2017 through 5 November, with about 75 per cent arriving in Italy and the remainder arriving in Greece, Cyprus and Spain. This compares with 337,773 arrivals across the region through the same period last year. 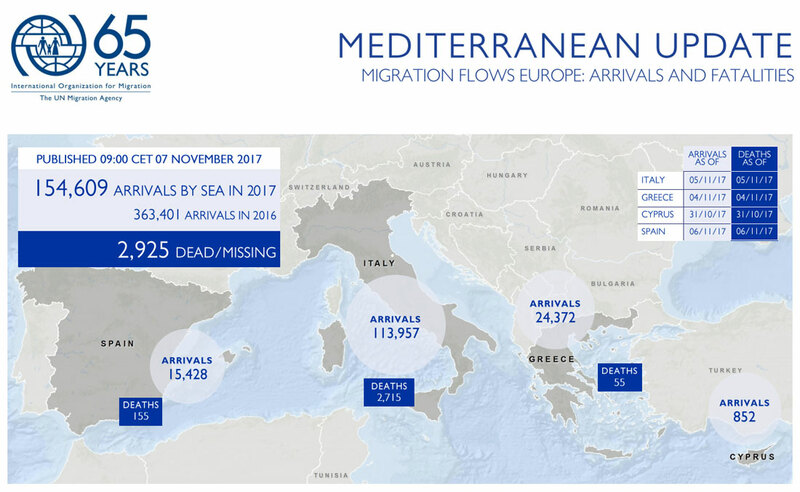 IOM Coordination Office for the Mediterranean reported Monday (6 November) on operations that saved over 2,560 migrants in just four days. Those same operations resulted in 34 recovered bodies and an estimated 50 more missing at sea, at the very least. “This is the outcome of one of the toughest weeks that rescue workers in the central Mediterranean route have experienced in the past for four months up to Monday,” said IOM Rome spokesperson Flavio Di Giacomo. The overall majority of migrants rescued during these days were West African nationals, but there were also some other nationalities: Bangladeshis, Eritreans, Egyptians, Sudanese, Moroccans, Syrians and Libyans. IOM staff also met an 89-year-old Syrian man, rescued at sea and brought to Taranto by the German ship "Mecklenburg", and a Nigerian girl who gave birth on board the Spanish Navy Ship “Cantabria,” soon after being rescued. The most dramatic instance came Sunday morning, when the Spanish Navy’s “Cantabria” – operating under the EunavforMed’s Operation Sophia – brought to Salerno (Campania) the remains of dozens of women, along with 402 migrants rescued in four different operations. Faced with the remains of only women and girls, the prefect of Salerno decided to open an investigation to clarify the circumstances of these deaths, not excluding the possibility of it being a case of homicide. Autopsies will determine the women’s actual causes of death. From the earliest information gathered during landing, IOM has learned that the bodies were recovered in two distinct operations. On Friday (3 November), the “Cantabria” rescued a sunken rubber dinghy, saving 64 people and recovering the bodies of 23 Nigerian girls. It is estimated that there were about 140 people on board, and – if this proves to have been the case – then the true number of those still missing would be close to 50. On the sunken vessel, there were several very young Nigerian girls. During another operation, the "Bergamini" ship of the Italian Navy retrieved corpses of three women on an inflatable boat that was transporting some 139 migrants. These were transferred to the “Cantabria”. Just days earlier, at least eight bodies were found by the Italian Coast Guard on a rubber dinghy with 150 people aboard. The migrants from these rescue operations have already been transferred to reception centres throughout Italy: in Lombardy, Apulia, Tuscany, Veneto, Piedmont, Emilia Romagna and Lazio. Survivors arriving in Salerno offered many dramatic stories: a girl claimed she was raped, another reported that she had seen her three children die at sea. The 2,560 migrants rescued in these days may represent an inversion of trend, compared to the arrivals from Libya registered in recent months. Starting in August, arrivals by sea averaged between 4,000 and 6,000 per month, a sharp decrease compared to earlier this year. In 2016, the number of migrants and refugees perishing at sea between North Africa, the Middle East and Europe totalled 718, with another 386 reported drowned during September. IOM Libya's Christine Petré reported Monday 48 migrants (35 men and 13 women) were rescued by the Libyan Coast Guard. According to their testimony as many as 82 migrants may remain missing since the vessel's capsizing. Among the rescued, nine reportedly suffered from burn injuries with two transferred to hospital. IOM assisted the migrants at the disembarkation point including with health assessments. She added that on 4 November, 151 migrants (137 men, one woman and 13 minors) were rescued at sea off Tripoli. All migrants were found in relatively stable health condition. So far in 2017, 19,333 migrants have been rescued or intercepted in Libyan waters. IOM Athens’ Kelly Namia reported Monday (6 November) news of at least five incidents off the islands of Lesvos, Chios and Kalymnos that required search and rescue operations in which the Hellenic Coast Guard rescued 234 migrants and transferred them to those respective islands. IOM’s Missing Migrants Project reported that Greek authorities recovered the body of a woman and were searching for six people missing after a wooden boat carrying migrants sank off Kalymnos Island, near Turkey’s coast, on Friday (3 November). The Turkish Coast Guard recovered two bodies from the same incident. Worldwide, IOM’s Missing Migrants Project (MMP) has recorded the deaths of 4,955 people migrating in 2017. In the Central Mediterranean, the remains of 26 women and girls were recovered over the weekend during rescue operations off the coast of Libya. On 3 November, the bodies of 23 Nigerian girls were recovered from a sunken rubber dinghy off the coast of Libya. Sixty-four people were rescued from this boat – according to survivors’ testimonies, there were about 140 people on board, so an estimated 50 migrants are still missing. During another rescue operation, the bodies of three women were recovered on an inflatable boat that was transporting 139 migrants. In the Western Mediterranean, one woman that was rescued from a sinking dinghy on 29 October died from severe fuel burns in a hospital in Tangiers, Morocco, on 4 November. In the Eastern Mediterranean, Greek and Turkish authorities together confirmed as many as eight dead or missing people. These deaths bring the total number of fatalities in the Mediterranean in 2017 to 2,925. At this time last year deaths on the three Mediterranean Sea routes totalled 4,305 – or nearly 1,400 more than 2017’s total thus far. Additionally, two deaths were recorded on the US/Mexico border: the skeletal remains of one migrant were recovered on 24 October in a ranch near Sarita, in Kenedy County (Texas), while another body was recovered near Falfurrias in Brooks County on 1 November.